New York (AFP) - Mel Stottlemyre, a former Major League Baseball All-Star pitcher who helped the New York Yankees and Mets to World Series titles, died Sunday of bone marrow cancer at age 77. The Yankees announced his passing on Monday in a website posting. Stottlemyre was a 1960s star for the Yankees, dropping the decisive 1964 World Series seventh game against St. Louis Cardinals legend Bob Gibson, and spent 10 years with both New York clubs as a pitching coach. Among the major league pitchers who Stottlemyre helped guide on World Series-winning teams were Mariano Rivera, Andy Pettitte and Roger Clemens of the 1996-2000 champion Yankees and Dwight Gooden and Ron Darling of the 1986 Mets. He also coached pitchers for Houston and Seattle before retiring in 2008. Stottlemyre was diagnosed with cancer in 2000. He underwent a stem-cell transplant and four months of chemotherapy to achieve remission but his cancer returned in 2011. 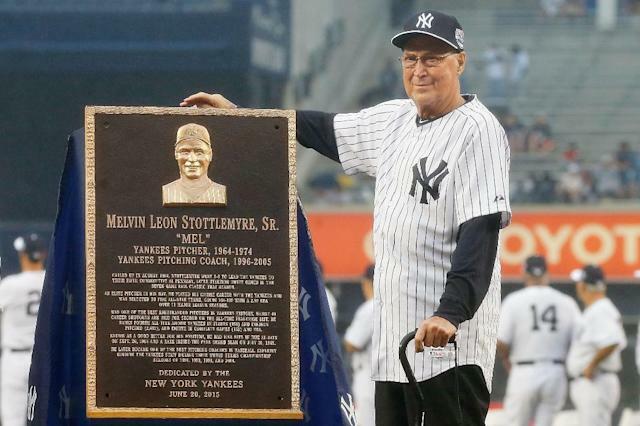 Stottlemyre, whose sons Todd and Mel Jr. followed him as major league pitchers, was honored with a plaque in Yankee Stadium in 2015. "He was such a wonderful man," said retired Yankee relief pitcher Mike Stanton, who worked under Stottlemyre with the Yankees for seven seasons. "He had a great sense of humor. Even when he wasn't feeling well, he always had a positive word. He was always very upbeat and looking to help. He's going to be sorely missed. This one hurts."